Answer: They wanted a nation which tolerated all religions. They argued for an elected Parliamentary government, subject to laws interpreted by a well-trained judiciary that was Independent of rulers and officials. They were not Democrats. Q3: By the mid-19th century in Europe, the idea which attracted widespread attention on the restructuring of society was ________. Q4: Who was the ruler of Russia before October 1917 revolution? Q5: Who conspired in Italy to bring about a revolution? Q6: Who were called 'greens'? Q7: When was the Socialist Revolutionary Party formed in Russia? Q8: Why did the Tsar dismiss the first Duma within 75 days of its election? Q9: Russia fought against _______ in the World War I that started in 1914. Q10: Which country did not back the forces opposing the 'reads'? Q11: Why did a lockout take place at a factory on the right bank of the River Neva on 22nd February 1917? Answer: It was extremely cold for the workers to work, because of frost and heavy snow and food shortages were deeply felt in the workers’ quarters situated on the left bank of the River Neva. Q13: When did the Tsar abdicate the throne? Q14: Why were most of the Bolshevik Party members initially surprised by ‘April Thesis’? 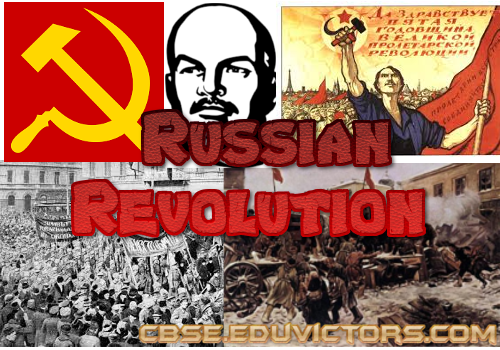 Q15: Who led the Bolshevik group in Russia during Russian Revolution? Q16: Who started ‘Collectivisation Programme’ in Russia? Q17: What were the collective farms called in Russia? Q19: In the Russian Civil War the Bolsheviks and the socialist revolutionaries were represented by which of the following colours? Q21: Who led the procession of workers to the event ‘Bloody Sunday’ in Russia? Q23: When was the Soviet Union formed?